This specific heat calculator is a tool that determines the heat capacity of a heated or a cooled sample. Specific heat is just the amount of thermal energy you need to supply to a sample weighing 1 kg to increase its temperature by 1 K. Read on to learn how to apply the heat capacity formula correctly to obtain a valid result. Determine whether you want to warm up the sample (give it some thermal energy) or cool it down (take some of this energy away). Insert the amount of energy supplied as a positive value. If you want to cool down the sample, insert the subtracted energy as a negative value. For example, we can assume that we want to reduce the thermal energy of the sample by 63000 J. Then Q = - 63000 J. 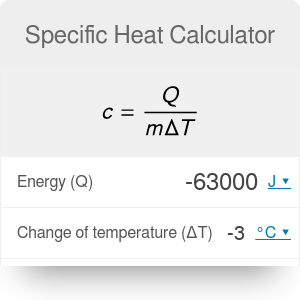 Decide what will be the temperature difference between the initial and final state of the sample and type that into the heat capacity calculator. If the sample is cooled down, the difference will be negative, and if warmed up - positive. Let's say we want to cool the sample down by 3 degrees. Then ΔT = - 3 K. You can also go to advanced mode to type the initial and final values of temperature manually. Determine the mass of the sample. We will assume m = 5 kg. Calculate specific heat as c = Q / (m * ΔT). In our example, it will be equal to c = -63000 J / (5 kg * -3 K) = 4200 J/(kg*K). This is the typical heat capacity of water. If you have problems with the units, feel free to use our temperature conversion or weight conversion calculators. Q is the amount of supplied or subtracted heat (in joules), m is the mass of the sample and ΔT is the difference between the initial and final temperature of the sample. Heat capacity is measured in J/(kg * K). You don't need to use the heat capacity calculator for the most common substances. The values of specific heat for some of the most popular ones are listed below. Having this information, you can also calculate how much energy you need to supply to a sample to increase or decrease its temperature. For instance, you can check how much heat you need to bring a pot of water to boiling so that you can cook some pasta. Wondering what the result actually means? Try our potential energy calculator to check how high you would raise the sample with this amount of energy. Or check how fast could the sample move with this kinetic energy calculator. Specific Heat Calculator can be embedded on your website to enrich the content you wrote and make it easier for your visitors to understand your message.